Here's a playful bunny that's ready take on the slopes! With a fluffy tail, soft boots and a fuzzy scarf, this soft plush toy is all set for fun or warm fire-side snuggles. What a great companion to take up and down, side to side, over and under any obstacle. And when the sun goes down, he's the perfect size for little hands to grab and carry off under cozy blankets. Plush Doll is 12" tall. Surface wash only. Safe for all ages. Time to tackle the bunny slope! Shake to help Bunny make it snow, tilt to help Bunny ski down the slope, and turn to help Bunny escape a cliff in his path. Is there any obstacle Bunny can't conquer? 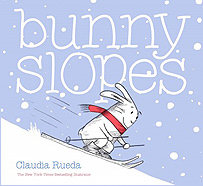 Bringing grins and guffaws with each turn of the page, readers will find Claudia Rueda's innovative bookmaking as entertaining as the twists and turns of a ski slope�and as satisfying as a cozy cup of hot cocoa. Author Claudia Rueda.